← The Sports Archives – Has The Curse of Vince Russo Been Lifted From TNA Wrestling? It’s interesting talking to people who learned to skydive just a few years before I did. The technology changed so quickly in just a few short years that there was a noticeable lag between countries. While I did the Accelerated Freefall course in Florida, people were still learning Static Line Progression and the Parachute Landing Fall in Vancouver, Canada, and some people still had round reserve canopies! When skydiving first became a sport, sometime after WWII, it was mostly done by former military personnel, playing with old surplus gear. It was pretty risky, considering the canopies were round. They were difficult to steer, and landing them was a crapshoot. Statistically, jumpers stood a very good chance of injuring an ankle on landing. By the 60’s, non-military daredevils were getting involved in the sport, and during the 70’s enough people were into it that new equipment was being developed, specifically for the sport jumping enthusiasts. Round canopies went through a relatively brief, high performance phase where they were designed for more maneuverability, while they also ended up a little more likely to malfunction. These were soon replaced by the parawing canopy that was popular through the rest of the 70’s. The parawing was designed to glide, giving the jumper the ability to control the flight of the canopy rather than just come straight down like they would under a round parachute. It was first used in the space program for astronauts and by the military for dropping cargo and personnel with much greater accuracy than the round canopies had ever afforded. By the end of the 70’s, the parawing gave way to the parafoil which had been designed nearly a decade earlier by a kite maker. This parafoil, or ram-air canopy was designed to trap air between two multi-celled, square or rectangular membranes. They were sewn together at the trailing edge and both sides, but left open at the leading edge to fill with air and create drag and lift. They are made out of lightweight nylon and separated by fabric ribs, creating 9 or 7 inflatable cells. It is the air which enters into the cells and inflates them which gives the canopy it’s airfoil shape. The shape makes the canopy act like a wing which can be controlled in much the same way as an airplane. These are designed to be highly controllable gliders. They have steering lines and toggles on both sides which work by lowering the back part of the wing in the direction you want to turn. Pulling the right toggle, lowers the back part of the right side of the wing, collapsing it a little, or a lot, depending on how hard you pull. You can make a gentle turn, or a deep spiraling hook turn. Pulling both toggles at once is like braking, and this is how you flare the canopy to stop and land gently. Jumpers can land with absolute precision on a target. Over the years, canopies have gotten smaller and offer more performance and control than ever. 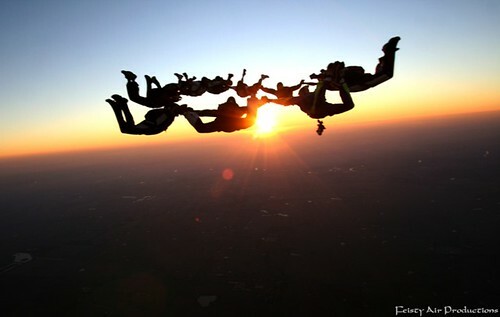 Skydiving, what was a sport exclusive too just a few ex-military guys, has become a mainstream sport enjoyed by countless adventurous men and women. Emma Grey is an extreme sports fanatic who currently plies her trade in the United States Army. She loves to write about a wide array of topics from skydiving and skiing to the use of robotics in the military. This entry was posted in Other and tagged accelerated freefall course, advice, change, cutting edge, evolution, extreme sport, Extreme Sports, extreme sports enthusiasts, gear, information, new, parachuting, skydiving, sports and leisure, Sports Archives, time, tips, travel, vacation. Bookmark the permalink.